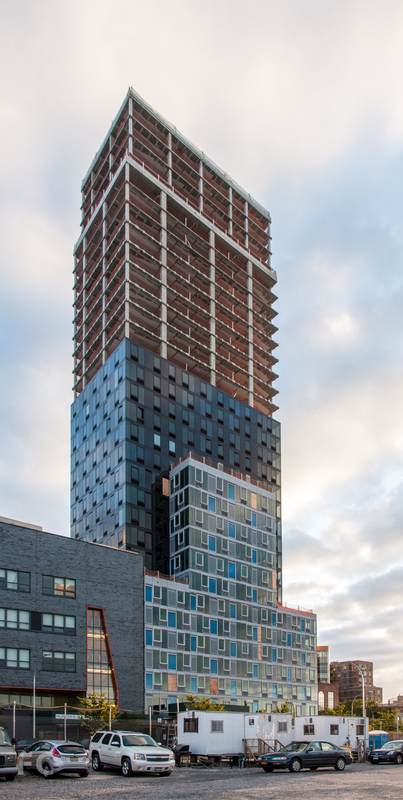 Since the last update in mid July, much progress has been made at Hunters Point South's phase one towers. The joint venture between Related, Monadnock, and Phipps Houses is the first phase of a long term project to significantly increase the amount of affordable housing available to residents of New York. Curtain wall installation is advancing at a steady pace, surpassing the half way mark on both towers. Interiors are also starting to show progress, with drywall installation occurring on several of the lower floors in each tower. The application process for the 925 affordable units in both buildings was slated to begin on October 1. Full completion of the phase one towers should occur sometime in 2015, with a target of spring for first occupancy. Sunrise over Long Island City from the pier of Gantry Plaza State Park. The northeast corner of Building A from 50th Avenue. The northeast corner of Building A (right) and Building B (left) from 50th Avenue. The southeast corner of Building A from 2nd Street. The south façade of Building A from Building B. The podium roof deck of Building A. The view of the Manhattan skyline from a lower level roof deck on Building A. The facades of Building A (left) and Building B (right). Building A (left) and Building B (right) from Hunters Point South Park. Building A (left) and Building B (right) from the oval green at Hunters Point South Park. The northeast corner of Building B and the Riverview School. The northeast corner of Building B. The south façade of Building B. Building B and the oval green of Hunters Point South Park from Building A. The northwest corner of Building B. The north façade of Building B. The north façade of Building B from the podium roof deck of Building A.
Façade installation on Building B. Detail of the curtain wall on Building B. Building A (left) and Building B (right) from Center Boulevard. The east façade of Building A (right) and Building B (left) from Borden Avenue.